THE BEADY EYE SAY’S. IT IS NOT SURPRISING THAT MOST COMMENTATORS HAVE NO GRIP ON THE ORIGINS OF THE IRISH BORDER. Posted by bobdillon33@gmail.com in Brexit v EU - Negotiations., Brexit., European Union., Gibraltar and Spain, Norther Ireland, Northern Ireland Border., Technology, Unanswered Questions. The current Brexit negotiations (which I believe in the long run will be worthless to the peoples of Ireland, England, Wales, Scotland, and Northern Ireland ) ARE CONFUSING TO ME AN IRISH MAN. Unfortunately, the border is drawn in hundreds of years of blood, NOT FRICTIONLESS TRADE IN GOODS. To those that have little to lose its only a matter of trade, between the EU and England when it leaves without an agreement. Answer these questions if you can. Who will have responsibility for it? What exactly are we talking about here, is it the consequences for political parties rather than people lives? If there is a border whether hard or otherwise do the terms of its application apply to the Spanish Gibraltar border? WHAT PRICE IS BEING ASKED BY THE EU – CONSOLIDATION OF CORPORATE TAX BASE. THE UK GOVERNMENT HAVE NO RIGHTS TO TEAR UP THE GOOD FRIDAY AGREEMENT. IT IS A MEANS TO AN END, NOT AN END TO A MEANS. What part of the Lisbon treaty or any another treaty for that matter allows the EU to negotiate what form its member borders should take or have? Northern Ireland voted to stay in the Eu so why not offer NI an association agreement like Andorra has a customs union? IF NORTHER IRELAND STAY WITHIN THE UK AGREEMENT OR NOT THE REALITY IS A HARD BORDER UNLESS WE HAVE A UNITED IRELAND. ( The Beady Eye Ask’s: Do you know what the Good Friday Agreement Agreed to. 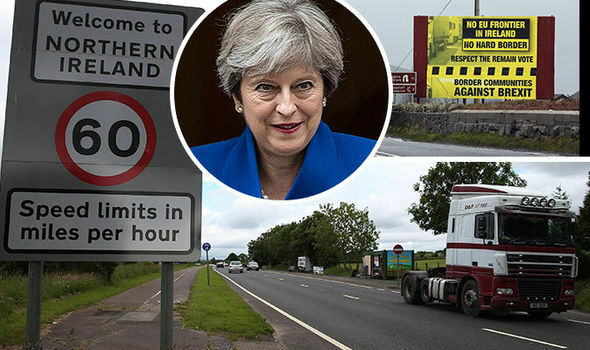 or The Beady Eye Say’s: This could be a good time to remind Ireland and Northern Ireland and England why the border between Ireland and Northern Ireland exists. THE BEADY ASK’S: DO YOU KNOW WHAT THE GOOD FRIDAY AGREEMENT AGREE TO. My recent Beady Eye post attempted to explain the origins of the Northern Ireland border. THE GOOD FRIDAY AGREEMENT ATTEMPTS TO RESOLVE THE PROBLEM. Up to the Good Friday agreement Northern Ireland was in effect a one-party state, in which half of the population was routinely discriminated against. The agreement marked a commitment to “the mutual respect, the civil rights and the religious liberties of everyone with Britain agreed to incorporate the European Convention of Human Rights into the law of Northern Ireland. This year marks the 20th anniversary of The Belfast Agreement, more commonly known as The Good Friday Agreement. SIGNED ON THE 10th April 1998. It effectively brought an end to The Troubles, which had raged in the region for thirty years. It was widely seen in Britain, as elsewhere, as a significant act of statesmanship, supported by both main parties. A devolved assembly was established for both sides to govern together and while unionists were assured of their British identity, a united Ireland was acknowledged as a legitimate political goal for Republicans. As the Irish border is becoming a critical issue in the Brexit negotiations, it now appears at risk. CONDEMNING THE AGREEMENT TO THE POLITICAL SHREDDER. Some 71 percent of people in Northern Ireland voted to accept the agreement in a referendum, with the DUP (NOW BRIBING THE CONSERVATIVE PARTY TO THE TUNE OF 6 BILLION TO REMAIN IN POWER) being the only party to reject it. The system of power-sharing government it established in Northern Ireland has not functioned for over a year. However, the collective failure in Northern Ireland will not be blamed just on Brexit nor on the DUP but on the EU if it agrees to any border visible or otherwise. The harder the border between north and south, the more reckless the UK’s decision to leave the EU will be judged. A significant amount of direct funding is at stake: the EU provides Northern Ireland with nearly a billion euros a year for agriculture, employment, and projects related to the peace process. Of course, no one talks about the other border between Gibraltar and Spain where British territory also has a historic claim placed on it by a foreign power, namely Spain. It will “make the Irish problem look like a picnic”. 96 percent of Gibraltarians voted to Remain in 2016. Of course there are differences between Northern Ireland and Gibraltar, obviously, based on geography, economics, and history. Gibraltar isn’t in the UK, but as a close overseas dependent territory, it may as well be. The EU has given Spain a formal veto over Brexit if Madrid is not happy with the Gibraltar dimensions of a Brexit deal. The Irish didn’t get that. Gibraltar could easily be treated much like other EU microstates such as Monaco, San Marino, Vatican City, and Andorra; EU members in all but name, albeit with no formal voting powers. SO WHY NOT NORTHERN IRELAND? GIBRALTAR REPRESENTS one tiny strip of land, two vetoes and three governments trying to achieve the impossible WHILE NORTHERN IRELAND REPRESENTS A HISTORICAL DISASTER WAITING TO HAPPEN AGAIN. Makes you wonder if all this collateral damage TO ALL CONCERNED is worth it.